Two added cylinders and loads more power. Despite the 2019 Ford Raptor being the most capable off-road truck on the market, and offering exceptional performance, there are some who can’t overlook the necessity of a V8. Ford’s decision to switch to a smaller V6 on the second-generation truck was met with some skepticism, even though the turbocharged 3.5-liter engine makes 450 horsepower (335 kilowatts) and 510 pound-feet (691-Newton meters) of torque. But for those who prefer the larger displacement block, Hennessey Performance has a solution: the VelociRaptor V8. Hennessey crams a 5.0-liter supercharged V8 underhood that delivers some serious noise and a healthy dose of added power, too. The Ford crate engine swap gives the Raptor 758 horsepower, which is enough to launch the truck to 60 miles per hour (96 kilometers per hour) in 4.1 seconds – a second quicker than the stock Raptor. Further modifications such as stainless steel cat-back exhaust, bigger fuel injectors, and higher-flow air induction help the VelociRaptor V8 run a 12.2-second quarter mile. 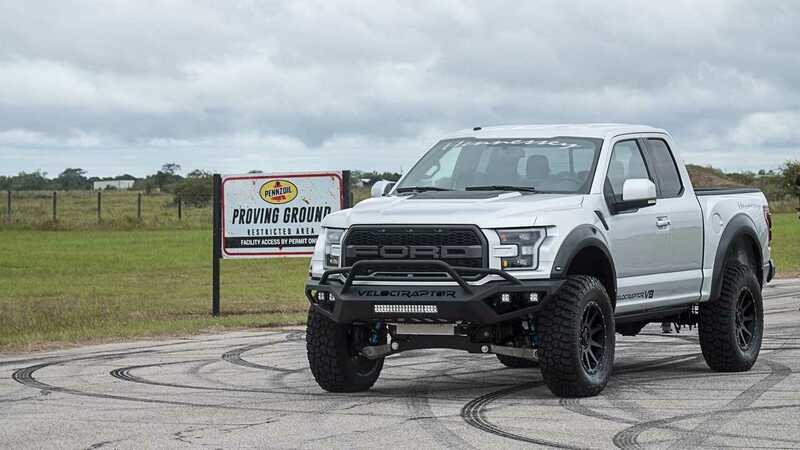 Exterior upgrades in the form of bigger 20-inch wheels and 37-inch tires, as well as more aggressive front and rear bumpers give the truck an intimidating look, especially lineup up next to the stock Raptor. The add-ons do little to slow the truck down, though. Just watch. Off the line, the Hennessey truck gets a major jump on the V6 Raptor, and never let’s down all the way to the finish line. Though this should come as a surprise to nobody, it’s a great reminder to see what can be done with an old-fashioned five-oh V8 and some plentiful tuning. The drag race results should serve as motivation to any potential Raptor buyer that loves the second-gen truck, but can’t seem to shake the idea of a V8 from their mind.